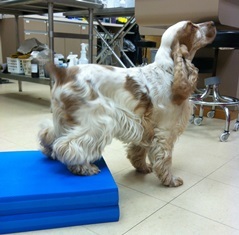 Did you know that Belle Mead Animal Hospital now offers Physical Rehabilitation to all of our clients? 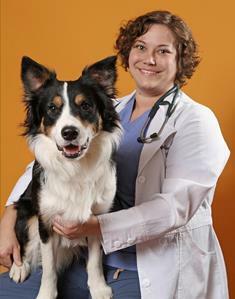 Dogs, cats and exotic companion mammals alike can now benefit from our new program – and to help you learn more, we are offering an Open House on Wednesday, October 22 at 7 p.m.
Dr. Somjen is currently undergoing certification through the University of Tennessee program, but is already offering her skills to many of our clients. 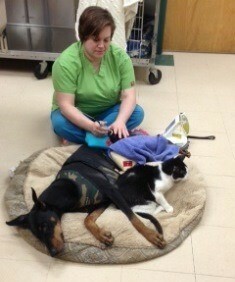 She is eager to share what she has learned and explain how our beloved pets have benefited. 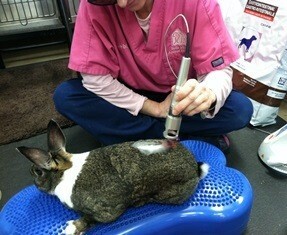 We at Belle Mead Animal Hospital are excited to be on the forefront in pain management for pets of all kinds. Better yet, we are able to combine physical rehabilitation with our regenerative medicine program here at Belle Mead Animal Hospital (stem cells and platelet rich plasma). What types of cases can we help? We can treat pets undergoing orthopedic surgery or suffering from arthritis and degenerative joint disease, pets suffering from herniated disks and other neurologic diseases, overweight pets, injured athletes or working dogs, and older animals slowing down and losing function. However, physical rehabilitation is not just for sick or injured pets – we can also use these skills on competitive canine athletes who need to stay in peak condition. Join us for our Open House on October 22! We will have a brief introduction to physical rehabilitation as well as demonstrations of the modalities and exercises. We will also discuss stem cell therapy and platelet rich plasma! Even better, we will have some of our current patients in rehab there to both talk about our experiences with them as well as show you how they receive a treatment! This is your chance to talk to the staff as well as Dr. Somjen, feel our electrical stimulation unit yourself, and enter your pet in a raffle for a free pet rehabilitation evaluation with Dr. Somjen! Please RSVP by Monday, October 20 at customerservice@bmvet.com or call us at 908-874-4447. We hope to see you at our Open House event! This entry was posted in Events, Exotics, General Pets, News, Sheep and Goats, Veterinary Medicine, Veterinary Services and tagged Cats, Dogs, Exotics, Pet Physical Rehabilitation. Bookmark the permalink.